Being single in the beautiful city of London. It ain't easy. I first came close to writing about Natalie Lue – of Baggage Reclaim fame – back in October 2010 when I attended her ‘Mr Unavailable’ workshop in central London. 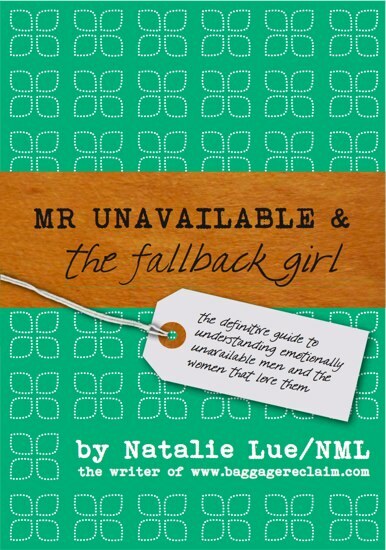 But now, a little over a year later, I’m very proud to say that Natalie’s teachings about the dangers of the dreaded Mr Unavailable are now available in print for all to buy. About Natalie. I’ve known her via Twitter for a little while now and I have also met her twice in real life. I can honestly say that not only is this woman an absolute sweetheart, but she is also extremely wise. I don’t know how’s she done it, but Natalie has taken her personal experiences and observations and parlayed them into a full time job AND a book deal to boot! If you haven’t checked out the Baggage Reclaim website, you don’t follow Natalie on Twitter or haven’t even seen her pearls of wisdom about “assclowns” (her word, not mine) when she comments on my blog posts please do have a read of a few of my favourite excerpts from her first published (there have been ebooks previously) book – Mr Unavailable & The Fallback Girl. “While I’ve educated many thousands of people on the perils of unavailable relationships and what healthy, committed relationships look like, this is also a journey in recognising that if you can’t date with your self-esteem in tow, you need to stop dating until you can. Mr Unavailable and the Fallback Girl will help you to stop being a passenger in shady, depleting relationships and stop treating these broken men like they’re messiahs while you’re someone who has to clamour around them for crumbs of attention, affection, and hints of commitment. These crumbs don’t become loaves and will leave you hungry for a real relationship. I want you to read this book and recognise that you need the loaf, a whole load and nothing but the loaf. Reading this book often left me wondering if Natalie has been secretly spying on me. Like, HOW DOES SHE KNOW? Another section of the book that hits a more than a little too close to home were the parts where she talks about ‘Future Fakers’ and ‘Fast Forwarders’. Remember ‘The One I Thought Could Be The One’ trilogy? Classic case of me falling for a future faker/fast forwarder. Problem is, I’ve dated more of those guys than I’d like to admit. Something in Common or Opposites Attract? Is A Personalised Dating Service The Way To Go? Do Black Women Get The Short End of The Dating Stick? Enter your email address to subscribe to The Single Filez and receive notifications of new posts by email. © 2010 – 2012 THE SINGLE FILEZ. ALL RIGHTS RESERVED.